Crab Boils can be found in many different regions across of the country. It’s a regional influence that dictates the ingredients and in Louisiana, it is common for crab boils to contain an abundance of crab, shrimp, and crawfish. In Georgia and South Carolina, the crab boils typically contain corn, sausage, crab, and shrimp. The newest restaurant in Batavia known as The Crabby Boil offers an authentic taste of Cajun flavor in the midwest. The Crabby Boil is Located at 220 N Randall Road in Batavia making it easily accessible from Randall Road. The Crabby Boil brings a unique flavor to the area and when a customer enters they are greeted by a hostess and brought to one of their wooden picnic tables. This is not a grab-and-go type of restaurant and is similar to a traditional restaurant with a waiter or waitress. Offering a variety of dishes, the restaurant offers entrees such as crab, lobster, shrimp, crawfish and other seafood. The prices will vary at these types of restaurants because certain items are priced at market value. Smaller dishes like calamari, crab cakes, and fish and chips can also be ordered. Ordering is a simple three-step process. Step one begins with a choice of crab, shrimp, mussels, or crawfish. Then, customers have the option to pick from a variety of flavorings: Cajun seasoning, garlic butter, lemon pepper, or cilantro lime. Finally, restaurant goers have the choice of sides: corn, andouille sausage, or potatoes. The customers food will be served in a large plastic bag, but don’t be alarmed, this is all a part of the experience. The bag contains your entree and your sides with the seasoning inside in one large mixture of flavors. Once the bag is opened a variety of seafood and seasonings will flood from the bag and into the air creating an aroma that is irresistible. I recently visited the Crabby Boil and ordered their combo meal No. 2. This meal is similar to a family meal and included shrimp, corn, andouille sausage, potatoes, and crab legs tossed in a variety of Cajun sauces and seasonings. I wasn’t exactly sure what to expect from a small seafood restaurant in the midwest, due to the fact that I visit Daytona Beach, Fla. Every year I have seafood fresh from the sea and was curious to see if the small seafood restaurant in the midwest would come close to the seafood in Florida. I was pleasantly surprised to find that the food was almost as fresh as the seafood I have had in Florida. 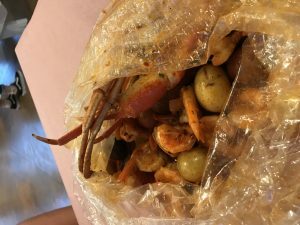 In conclusion, The Crabby Boil offers a taste to the area that is fresh and uncommon. I would recommend this to seafood lovers and those who are willing to try something new.